If a repair looks right then the there is a good probability is that it is right. Reliability should be built into every repair that is undertaken with the minimum standard being that of returning the machine (a pump in this instance) to the condition it was manufactured to and wherever possible to improve the reliability by good engineering practice. 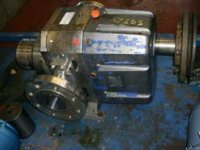 In this instance the repair is to a Rotary Lobe Pump and whilst the original design dates back to the 1930’s it has been further developed and improved as new materials and manufacturing processes have become available. 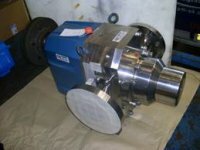 The pump in question is used to deliver sensitive semi fluid foods during the manufacturing process, this type of pump is particularly suitable for these type of applications as lobe pumps have few cavities and therefore are easy to clean and reduces the risk of bacterial growth within the pump. This type of pump can also be used in such diverse applications as pharmaceutical, chemical cosmetic and paper production. While very reliable, maintenance is an important part of maintaining the performance of such pumps. Although the optimum operation depends very much on the production environment and application periodic inspection with the pump out of production is vitally important if failure is to be avoided along with the associated downtime and costs caused by secondary damage to the pump. The mechanical seals are precision engineered components with finally lapped surfaces which should be re-lapped or replaced at intervals as should the ‘O’ rings and shaft seals. Oil levels should be regularly monitored and if necessary ‘topped up’ but never overfilled. The bearings and vibration levels should be monitored and a strict cleaning regime maintained. If a good maintenance plan is in place then these pumps should give trouble free operation, and failure should be avoided. This repair included the replacement of mechanical seals, O rings, bearings and reclamation of the seal seating before being tested and returned to the customer.